After all that backbreaking work, I can now bask on the glory of the (almost) finished article. Almost finished is overstating the fact: after the mini-digger left the rest of the landscaping takes place just with the pair of us and some hand tools, i.e., slowly. So here are the photos (top to bottom): an overall photo of how it is now, one of the waterfall and a close-up showing the overflow and how clean the water has become. I’ve tried to reduce the landscaping to individual components rather than a scary whole and so I’d started yesterday morning with an idea that I was going to finish the pathway linking the house to the polytunnel, passing between the plant filter and the pond. Over breakfast, Gabrielle asked whether we should bury the hose linking the rainwater collection system and the polytunnel: “Yes, she had a point”. But if I was to do that, then I might as well dig the trench to bury the electric cable to the pump at the same time. A 90º turn and I’m absorbed by a completely different task to the one I envisaged: 30 metres of trenches to be dug half a metre deep in heavy clay soil with loads of stones. I’d hoped to have this section of landscaping finished by close of play today but rain intervened and so I stayed mostly in the dry and have wired up the pond pump through a timer with the cable safely buried underground. I hope to finish the path this week, one side of which will be some broken concrete drain pipe that was dug up when I installed a French drain along our barn. The permaculture part of this is to try and reuse stuff onsite rather than taking down the tip to become somebody else’s disposal problem. We’re going to chop the bits of pipe up with an angle grinder and place then side by side like a church organ’s pipes, filling them with earth and planting pretty sedums therein. It looks (and I bet it sounds) lovely. 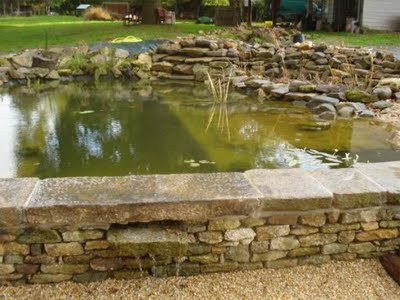 Curious that, while waiting for a file to attach to an email regards a pond I plan to build I popped onto your blog and there was a lovely picture of your own pond! It looks great by the way and is actually about the size and design type I aim for, well maybe a bit smaller, mine will be 3m by 2m. 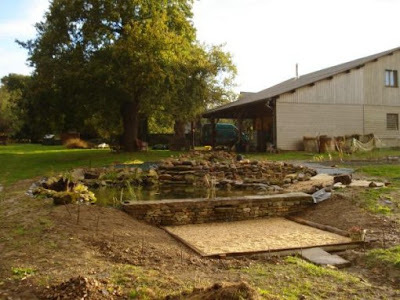 Now I'm sure you could write a small book on your experiences of building it but can I just ask one wee question, any tips for building the waterfall feature? I want to do one for my client but have never did it before so wondering am I taking on too much. 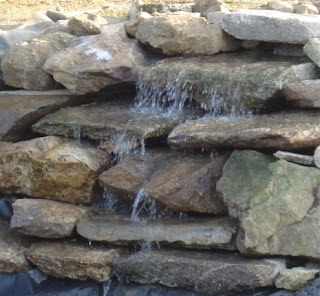 The pond will hold about 3000litres of water and the waterfall will have a head height of 60cm approx, but not sure what pump size I'd need. Thanks a mil and well done for the great work. P.s. That enquiry regards the pond was from myself David Neavyn over in Ireland, I don't think that was clear the first time around.